If you read my blog you'll know I travel a lot-mostly with work but I have been to the UK a few times and the States for pleasure as well this year. 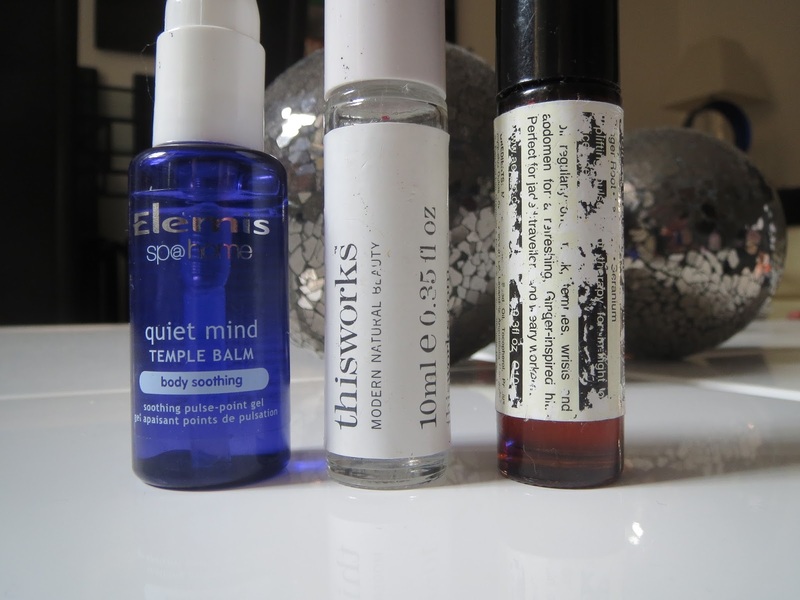 Here are my favourite long haul flight essentials. 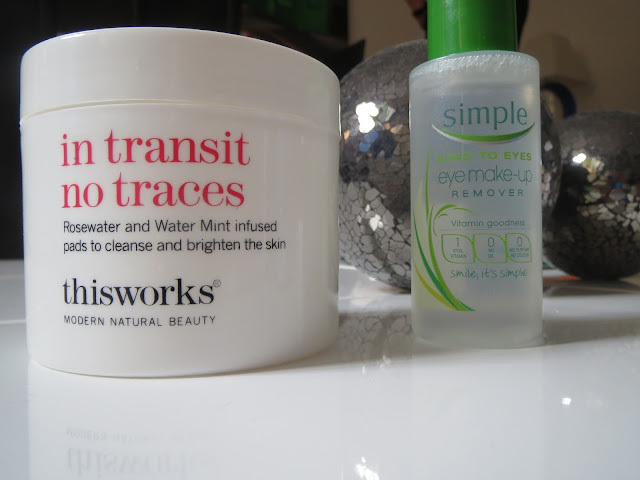 I am obsessed with removing my make up as soon as I get on the flight and my current favourite thing to use to do that is the ThisWorks In Transit No Traces pads. These are liquid infused pads (I don't want to use the dreaded word 'facial wipes') but these cleanse my skin thoroughly without leaving it dry or tight. They feel really cooling on the skin too. 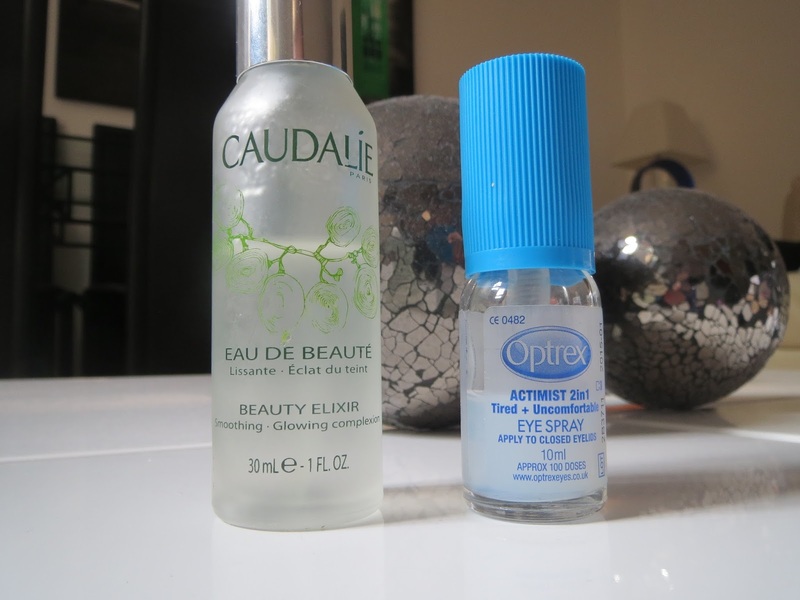 I also packed a mini bottle of Simple to remove any stubborn mascara even though the ThisWorks can be used on the eyes. 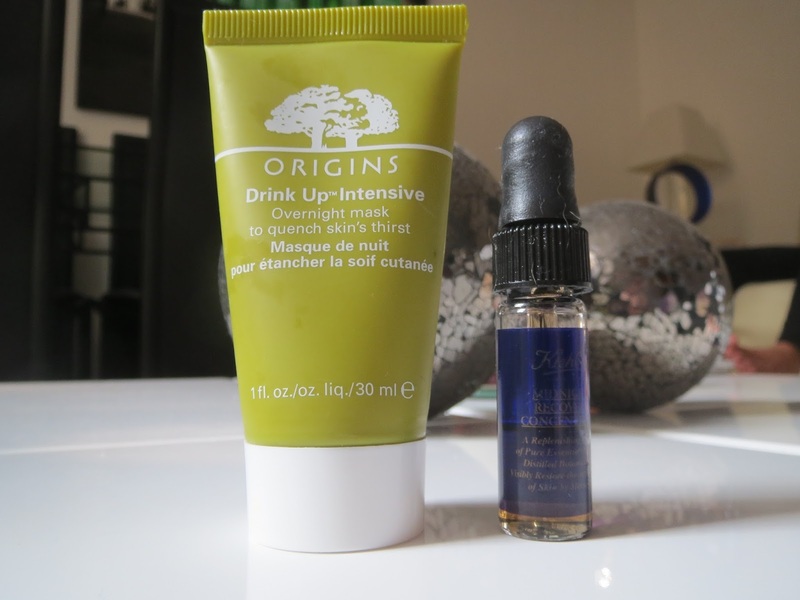 I threw in a mini Origins Drink Up Intensive mask to provide essential hydration. This mask is great because it goes on clear (you then don't scare other passengers or the crew) and sinks into the skin so you don't look like you're wearing a full on face mask but your skin is reaping it's invisible benefits. Air cabins are really dehydrating so everything I pack is usually moisturising to stop my skin drying out. I also packed a mini vial of Kiehls Midnight Recovery which I pressed into my skin after removing the mask with one of the in flight flannels. This is a light serum which works overnight to replenish, repair and regenerate your skin. You could use either or, I used both! Our first flight to the UK was at 02:30 so it was a case of make up off, mask on, bed down and sleep as much as possible. But this Kiehls serum helps you to fake a full nights sleep! My eyes often feel sore but I find this handy spray from Optrex alleviates that-you spray it on over closed eyes whenever you feel your eyes need it. This is the 'tired and uncomfortable' version but I also have the one for irritated eyes. No stranger to beauty bloggers, once I did wake up I sprayed the Caudalie Beauty Elixir all over (and all over Mike) to add a boost of radiance. I am not a massive fan of the smell of this but it does seem to perk up my skin. I also pack little aromatherapy rollerballs-for night flights the Elemis quiet mind temple balm and ThisWorks Deep Sleep Stress Less are a good combo for relaxation. For day flights and for times when I need to feel a bit more awake, the Aesop Ginger Flight therapy provides a zingy burst of energy and is well loved and well used as you can see! Finally in my little skincare pouch I pack a lip balm-this one from Balm Balm was free with my Latest in Beauty advent calender but I really like it and it's very nourishing, 2 mini vials of perfume which were free samples and a Bath and Body Works hand sanitizer-how adorable is this one with the kitty on it! here- I am quite surprised that I have downsized a little though! To be honest, it is a bit silly taking make-up on board because as soon as I arrived at Danielle's I had a shower and remove it all but I wanted to look a little bit presentable on arrival! Here's the minimal kit I took. I decanted some of my normal moisturiser into a little Sephora pot-I am currently using the very light Caudalie Vinoperfect moisturising sorbet. I also packed a free sample pot of Murad eye cream I had received and sadly when I tried this I had a very bad reaction to it-my eyes puffed up and my skin looked and felt burnt and crepe-y underneath. It was really painful and took 2 days to go down. I am really disappointed because the texture of the cream is really lovely to apply. 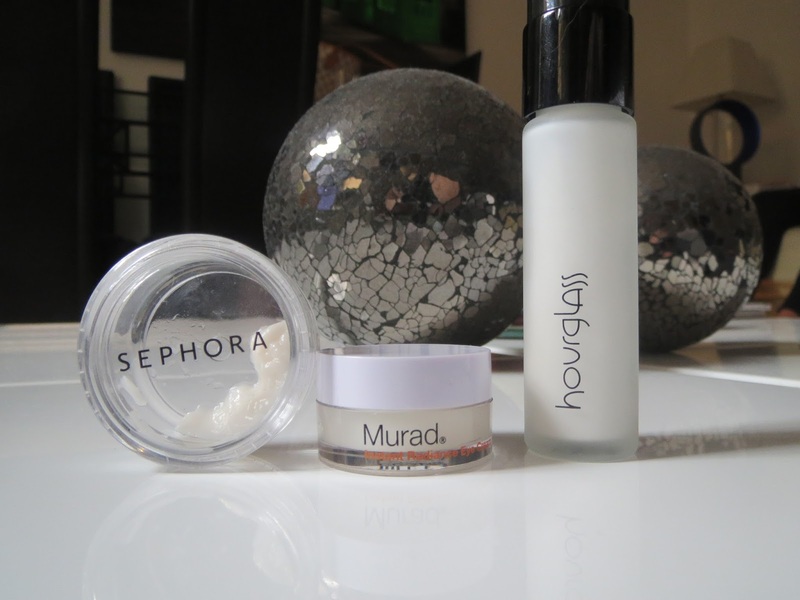 I also threw in a mini sample of the Hourglass primer-I need to try it more before giving a verdict. 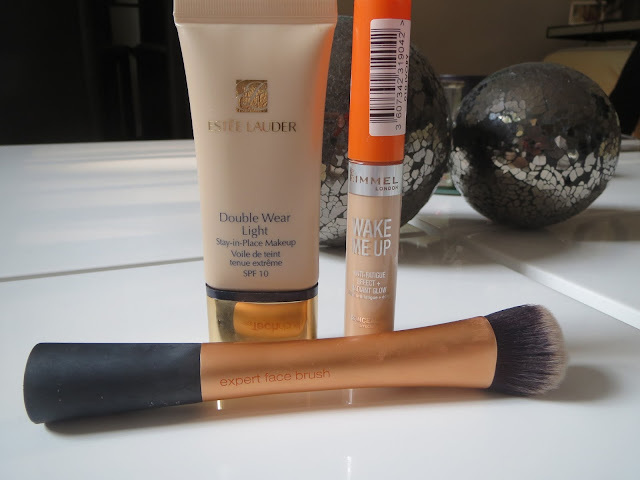 The day before I flew I picked up the Estee Lauder Double Wear Light as a less heavy alternative to the Estee Lauder Double Wear I am currently wearing for work. I'm really on the fence about it-I am the lightest shade but it's still slightly too dark for me and requires a lot of blending to avoid the horrible tidemark round your neck. When I apply with a brush I feel like the brush soaks up so much of the product, so I switched to applying with fingers. When I first apply it I feel like the coverage is really sheer-but it can be built up and it sets to a nice matte finish. It takes a bit of work but I think I like it. I also packed the Rimmel Wake Me Up concealer but didn't use it because of the reaction I had with the eye cream and a Real Techniques expert face brush. 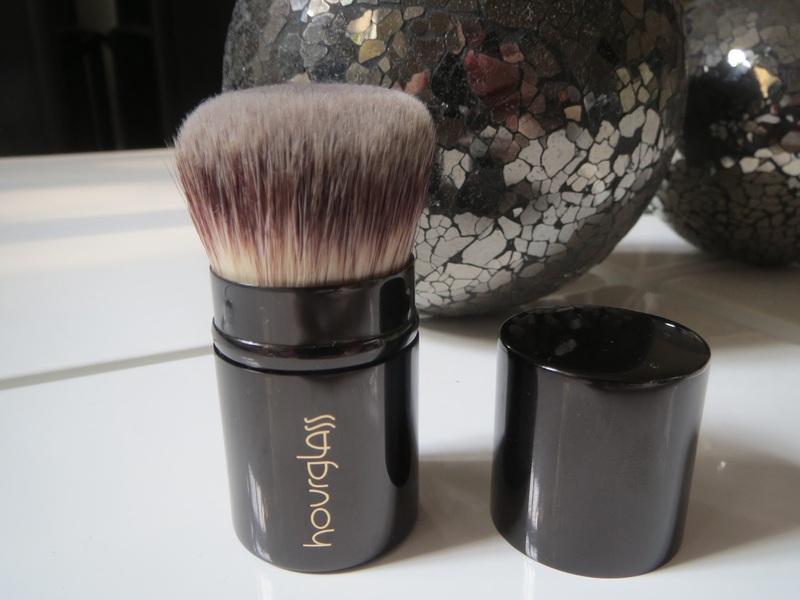 I used my beloved Mac blot powder to set the foundation using this absolutely brilliant retractable Kabuki brush from Hourglass-it's the softest I have ever used. 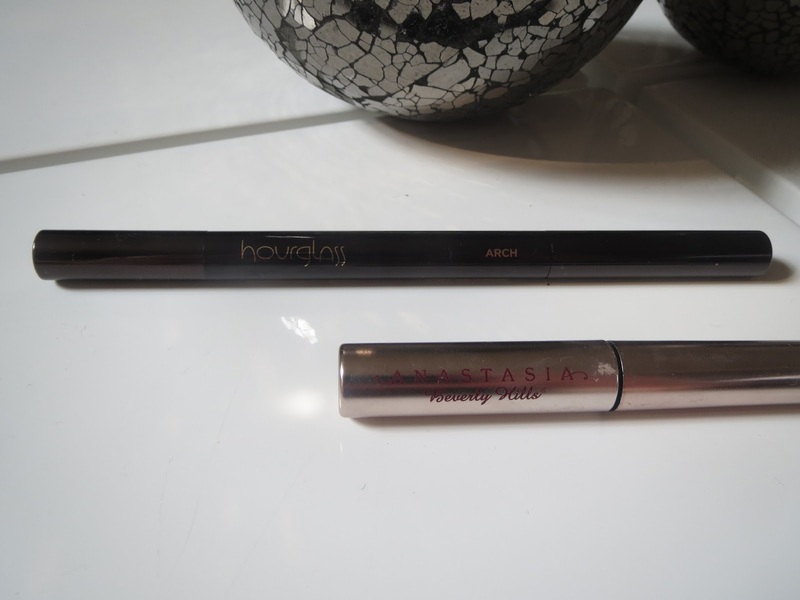 I packed the Hourglass Arch brow pencil which is quick and easy to use for filling the eyebrows and a mini Anastasia brow setting gel. 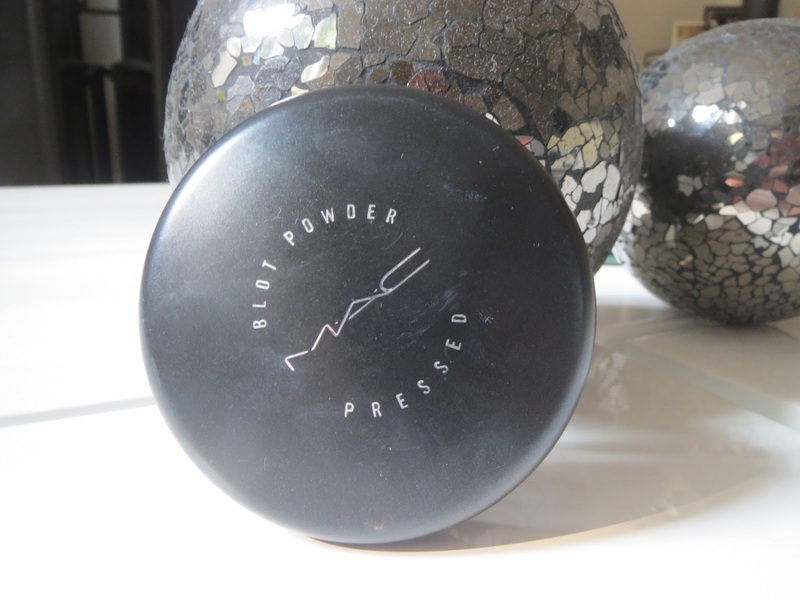 I love this and need to repurchase as this is on its last legs! For eyes I packed a couple of easy to use bronze-y shades-Mac Eclair paint pot and a Make Up For Ever Aqua Shadow pencil. On the flight (and most of the holiday) I plumped for the pencil as it is so easy to use, a gorgeous colour, doesn't crease and stays put! 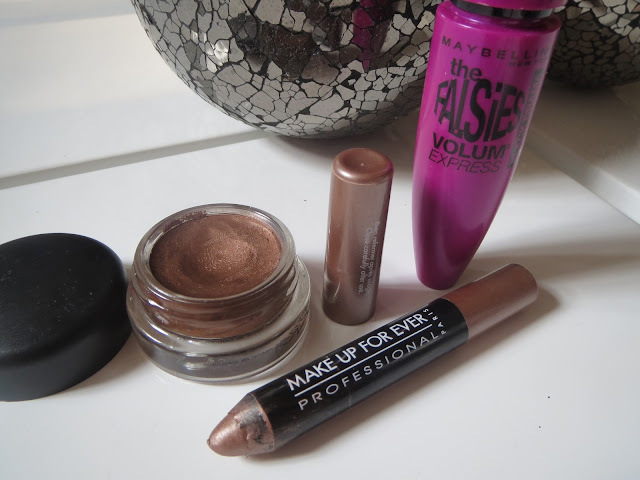 I couldn't be seen without mascara so my Maybelline the Falsies made the cut! Finally I packed a gloss and a lipstick-a girl likes to have options! 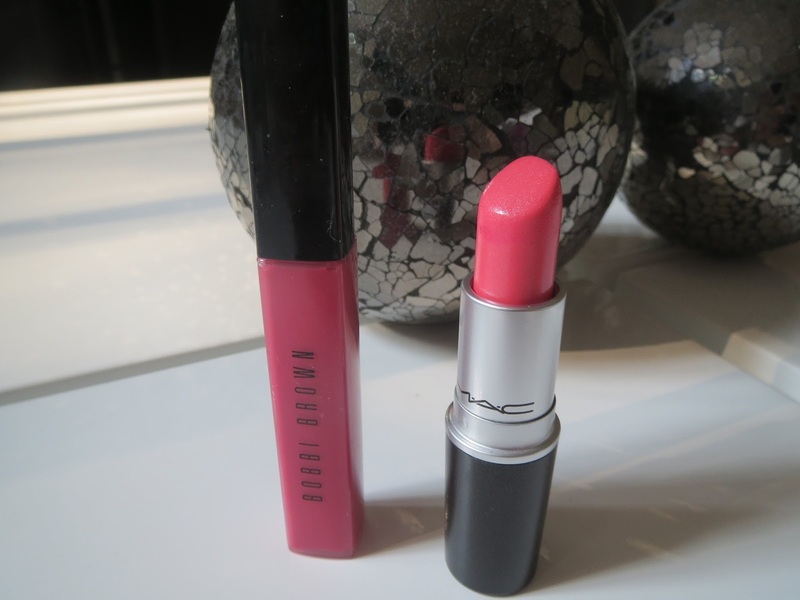 I went for pinks-Bobbi Brown Hot Pink 16 lip gloss and Mac Pink Pearl Pop cremesheen lipstick. I plumped for the gloss as it's easy to throw on. 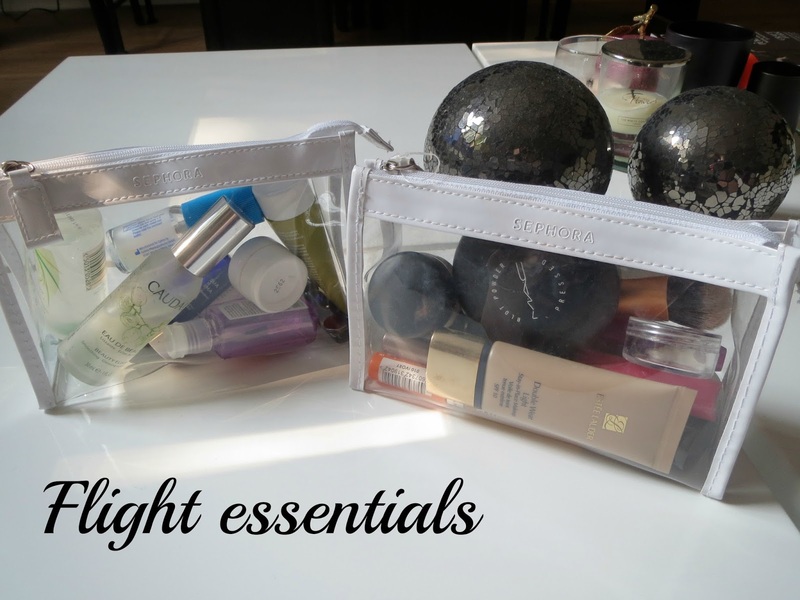 I think I have long haul flight beauty essentials pretty much covered these days but am always open to suggestions of your 'can't live without' travel essentials!